drama | Mel Reads YA! “Reached” was released in early November, and it has been a popular success, appearing on many YA bestseller lists. 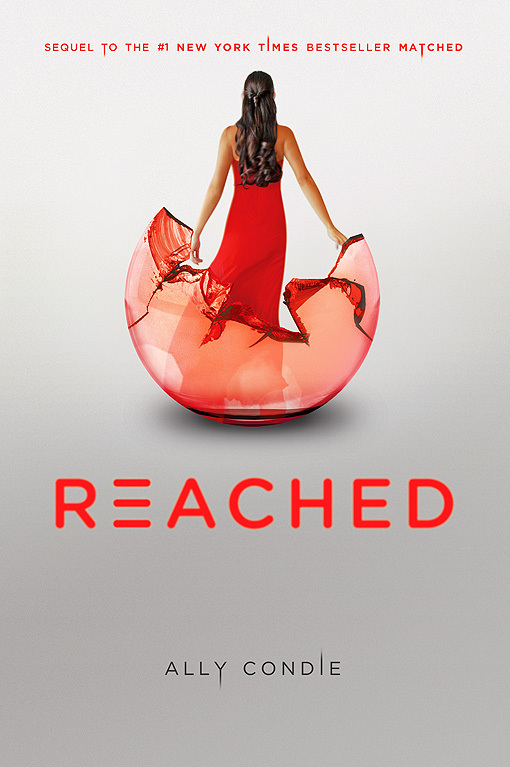 I was STOKED to read “Reached,” as I hoped it would combine the ethereal writing of “Matched” and the breakneck pace of “Crossed.” Alas, while “Reached” is by no means a failure, it is underwhelming and flat. I’m so sorry to write these words, but, for me, “Reached” was plodding and uneventful. I wanted it to be so much more. Ok, read on at your own risk, because I need to reveal some details to properly review this novel. As “Reached” begins, Xander is an Official with the Society (but secretly working for the Rising), while Ky is flying directly for the Pilot and Cassia is back sorting for the Society, waiting for the Rising to contact her, and conducting back alley trades with the Archivists. Each of the three main characters narrates his or her own story, so we get lots of insight and various perspectives on the action. The use of multiple narrators is surprisingly effective. The great revelation of “Reached” — maybe the only real revelation of “Reached”?! — lies in the fact that Xander is a remarkably complex, deeply wounded, deeply obligated man, which we may not have discovered without his individual narration. As it turns out, the Rising has unleashed the Plague on the Cities and Boroughs of the Society. Via some seriously convoluted logic, the Pilot believes that spreading the deadly virus will break the Society’s hold on the population, as the Rising members — all of whom are immunized — will sweep in and provide the cure to a grateful nation. Um, ok, I guess. At first, the Pilot’s plan seems dope, as Society falls with barely a whisper. (I honestly thought of those last lines from TS Eliot’s “Hollow Men,” that “this is the way the world ends, not with a bang but a whimper.”) But then the Plague mutates — and here we are subjected to some incredibly tedious virology discussion — and forms a new version of the virus that not only makes victims still, it actively kills them, regardless of cure or treatment. Even worse for the Rising? The immunization it provided its own members is no protection against the mutation. Only those with a special mark on their necks, who had previously been exposed and survived, are immune, and that’s a very small percentage of the populace (but, of course, it includes Xander and Cassia). Much of the “action” — and I use that term loosely, because very little in the way of plot occurs — involves the three teens finally joining forces in an outer mountainous community (Endstone, one of the so-called stone villages) to find a cure for the mutation. Leaving aside the highly dubious prospect that the fate of Society would rest with a bunch of teenagers, even this mess is sort of blah. There’s a rad old Society exile named Oker, who is leading the team of scientists, and we briefly — and I mean briefly — see our old pals Eli and Hunter, but mostly it’s Xander, Cassia, and Ky in a race against time. You’d think this might be a compelling setup, but it’s so hollow and dull that I found myself barely caring. Ky quickly falls ill, and there is some small bit of sabotage and danger, but mostly we’re treated to mundane passages about working, sorting, measuring, working, etc. Eh. What’s so unfortunate is that true moments of beauty and lyricism exist throughout the story, along with some lovely ideas about the relationship between art and community. Author Condie’s descriptions are as lush as ever; nature bursts with colors, scents, and textures, all gorgeously rendered. Cassia creates a gallery on Camas, in which ordinary people — so long deprived of freedom of expression — share sculptures, poems, pictures, and even songs. The vibrancy of this community, and the joyous celebration involved by those participating in it, are so touchingly real. Even Cassia’s growing embrace of poetry remains fresh and alive. We feel the seductive pull of poetry, of words and their purest expression. Sadly, though, these beautiful passages and scenes only serve to underscore the slow, almost methodical nature of the rest of the story. The search for a new cure meanders, while the expected drama — deaths, love affairs — is muted, often occurring “offscreen.” How are we to react to a death that we don’t even witness? Full props to Condie for her willingness to off major characters, but I so wish that when those lives ended, we readers were allowed more than a passing glance. Moreover, the resolution to the trilogy’s core love triangle is so telegraphed and so devoid of emotion that I had to go back several times and make sure I wasn’t just glossing over some hidden details. I wasn’t. It really was that empty. If not for the development of Xander’s character and the exploration of how his whole life centers on the loneliness of duty, I may well have given up before the novel’s end. Fans of the first two books in the “Matched” trilogy will undoubtedly rush out and read “Reached,” and I’m certainly not one to dissuade them. Some sections of “Reached” are as achingly lovely as ever, and following Xander’s character is rewarding in its own way. But the larger plot — or lack thereof — and an overall sense of inertia really weigh “Reached” down. Like its predecessors, this one is good for older middle schoolers and up. Who knows, maybe you’ll enjoy it more than I did. I sure hope so! When we meet A, A is in the body of Justin, a typical brooding high school guy with a chip on his shoulder and a pretty girlfriend. That girlfriend is the vulnerable, often heartbroken Rhiannon, who basically stays with Justin because (a) she thinks he’ll become a better version of himself, and (b) she’s afraid to be alone. Lo and behold, when A is in Justin’s body, Justin is, indeed, a better version of himself. A ignores the “rules” and has Justin do some un-Justin-like things, like ditching school and taking Rhiannon to the beach. Even worse (or better? ), A-as-Justin is suddenly more caring, attentive, and open, leading the beaten-down Rhiannon to emerge more fully from her protective shell. In one epic day, Rhiannon falls in love with “Justin” again, while A, for the first time in A’s life, falls in love, too. Except, of course, that epic day has to end. When A next lands in the body of Nathan, an overachieving, straight-laced guy, he drives for hours and crashes a party attended by Rhiannon. “Nathan,” posing as a gay, non-romantic interest, dances the night away with Rhiannon and later contacts her by email. (A keeps a personal email account.) Unfortunately, A has to keep Nathan out late for the party — the switch to the next host always occurs at midnight, regardless — meaning that Nathan wakes up on the side of the road with no memory of how he got there. When Nathan’s story of demonic possession goes viral — and when Nathan himself starts emailing A demanding answers — A’s anonymity and very existence become threatened. Still, being smitten and nursing the hope of finally living a regular life, A risks all and reveals all to Rhiannon. She reluctantly agrees to keep meeting A, in all A’s different bodies, while she sorts out her feelings. 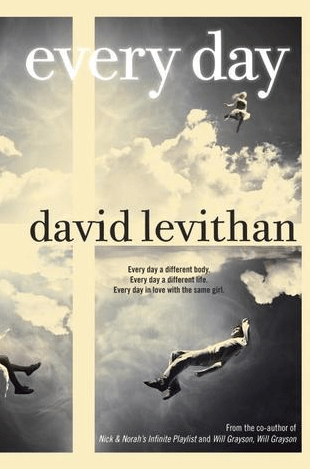 “Every Day” is so thought provoking and raises such intriguing questions about personhood and identity and love, that for these reasons alone — not to mention the beautiful writing and amazingly complex one-day characterizations — it’s a winner. Do we really love the person inside, or is the exterior an inevitable factor? A slowly realizes that it’s easier for Rhiannon to connect with him when A is inhabiting a hot guy than when A is morbidly obese or female. A is such a remarkable character, mature beyond A’s earthly years, yet still a teenager who can be rash and impulsive. But A is different in one crucial way. Unlike the rest of us, A sees no gender or sexual orientation. A exists as a pure identity. An essence. A being. Seeing how this all plays out is illuminating and heartbreaking and kind of beautiful. Huge kudos to David Levithan for pulling off the logistics of the hosting so smoothly and for making the romance between A and Rhiannon so incredibly ill fated (and, thus, so incredibly intriguing). There are some truly genius touches here — A inhabits twins on back-to-back days, allowing A to see the after effects on the host — as well as so many captivating insights into the relationships between teens and their peers, parents, and siblings. I highly recommend “Every Day” to older middle and high school readers. It’s really like nothing else I’ve ever read, and a full week after finishing it, I still find myself thinking about A. Which, sign of a great book, y’all. Please check out “Every Day” and see what you think! Ruta Sepetys’ “Between Shades of Gray” is one of the most beautiful, evocative pieces of historical fiction I’ve ever encountered, teen or otherwise. It sheds much needed light on a largely hidden moment in history, when Soviet Premier Josef Stalin deported and imprisoned thousands of political prisoners from the Baltic nations of Estonia, Latvia, and Lithuania. These innocent people — men, women, and children — were ripped from their lives, transported like cattle in filthy conditions, only to be beaten, starved, and worked to death at prison camps in remote areas of Siberia. Their only crime? Being deemed a danger to the repressive Soviet regime that had annexed their Baltic nations. Their real crime? Nothing other than being professors, teachers, doctors, army officers, and librarians. We meet 15 year old Lina on the night in June of 1941 when Soviet NKVD (secret police) officers storm her house in Lithuania, taking her, her mother Elena, and her 10 year old brother Jonas into custody. (Lina’s papa has already disappeared.) Lina’s family has all of 20 minutes to gather their belongings before being herded onto a truck and, eventually, a train, bound for parts unknown. Mind you, they have done nothing wrong. The train car is a true horror: people are packed in with no room for movement and no bathroom facilities other than a hole in the corner of the car. Ona, a woman who has recently given birth, is left bleeding on a plank in the car, her infant daughter dying slowly from starvation. Author Sepetys captures the fear, humiliation, and anger that Lina and her fellow travelers feel, this utterly awful sense of shame and bone-chilling terror at what will happen next. Eventually, over the course of six weeks, the Lithuanian prisoners make their way to Altai Province, in the southern portion of Siberia. Lina’s family, thin and weak, is thrown into a hut with a brute of a local woman, Ulyushka. Everyone at the Altai camp is forced to work at least 12 hours a day to earn one meager bread ration, which is barely enough to keep a person alive. Lina and Elena are eventually assigned to farm beets and potatoes, while Jonas works with Siberian women making shoes. The mother of the lone teen boy on the trip, Andrius Arvydas (his mother bribed an NKVD guard to have him deemed feeble), is forced into prostitution at the NKVD officers’ barracks. Many nights, the Lithuanians are roused from their sleep at gunpoint and threatened by the sadistic Commander Komorov to sign a “confession” condemning them to 25 years of hard labor. It is a lonely, miserable existence, filled with pain, hunger, and far too much sickness and death. Lina’s escape from this wretched life lies in her sketches — of Lithuania, Jonas, Mrs. Arvydas, Andrius, her missing papa — and memories of a better life in Lithuania. Lina could be killed for her “treasonous” sketches, which she hides in the lining of her suitcase, but they are a lifeline for her. Many references are made throughout the novel to the works of Norwegian artist Edvard Munch, whose depictions of raw emotional pain are models for Lina’s work. [Click here to see an image of Munch’s most iconic work, The Scream.] Lina is one brave and talented girl. After nearly a year in Altai, Lina and her family, along with hundreds of Lithuanian and other Baltic peoples, are ferried by train, truck, and ship to Trofimovsk, an absolutely desolate land that lies above the Arctic Circle. Trofimovsk makes Altai seem like a luxury resort. The polar night (continuous darkness) lasts for months on end; dangerously frigid temperatures and continuous blizzards threaten the group’s very survival; starvation, typhus, dysentery, and scurvy are constant killers; and the prisoners’ living conditions — crude, self-built mud huts in a polar region — are subhuman. Without the late appearance of Dr. Samodurov (a real figure, as described here), all the prisoners would have perished during that first miserable winter. In discussion materials and an author note afterward, Sepetys describes “Between Shades of Gray” as, ultimately, a love story. The Baltic people survived by using love as their sustaining force. I agree. 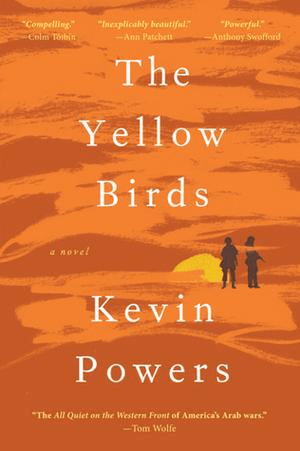 Despite its devastating subject matter, this novel is warm, uplifting, and hopeful. Lina’s love for Elena and Jonas, for her imprisoned father and lost homeland, and, finally, for the strong, kind Andrius, buoys what otherwise may have been a bleak and depressing tale. There is so much life and love in these pages, so much hope and triumph, that it goes a long way in easing some of the pain. The prisoners continue to maintain their national and familial pride — Lina creates patriotic artwork, the Lithuanians celebrate their holidays in the depths of work camp blight, and the homesick and heartbroken share cherished family photographs that were hastily grabbed after arrests — which is beautiful and inspiring. Even small kindnesses, like the Siberian co-worker who saves Jonas from the ravages of scurvy, add to the impression that although we have seen the worst of humanity, the best of humanity still quietly endures. So, yes, love IS the central theme here. And what a necessary message that is for young people to receive. “Between Shades of Gray” also impressively tempers even its most beastly characters, including some of the heartless NKVD officers, the stoic native Altains, and the “bald man,” an embittered Lithuanian prisoner who constantly criticizes his fellow detainees. Sepetys uses one NKVD officer, the young Nikolai Kretzky, most dramatically to show the withering effect of these atrocities on a basically decent Russian who is “just following orders.” The real villain here, the one never actually seen, is Soviet Premier Josef Stalin, who masterminded the deaths of MILLIONS of innocents. As a stand in, we get all the people who spared themselves but made that devastation possible — Lithuanians who gave information, Soviets who abided by a culture of fear and secrecy, and NKVD officers who channeled their own personal failings into either wholesale prisoner abuse or, at the very least, willful ignorance of the horrors surrounding them. I absolutely recommend “Between Shades of Gray” to students in upper middle school and higher. This is a difficult book, and I don’t mean to minimize that in any way. There is violence, death, and depravity, but much of it is handled “off screen” and little of it is overwhelming in detail or presentation. 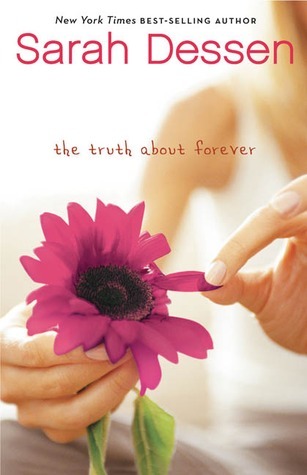 As mentioned above, the sum effect of this novel, the feeling you are left with at the end, is one of joy and promise. 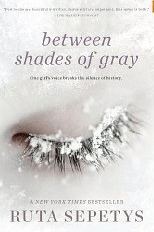 Please, give “Between Shades of Gray” a try. You will be glad you did. As if being an unpopular sixth grade girl isn’t difficult enough, try adding the slowing of the Earth’s rotation — and all its cataclysmic effects — to the mix. 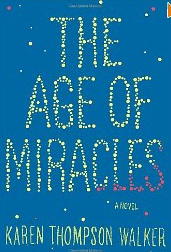 That’s the premise of Karen Thompson Walker’s remarkable debut novel “The Age of Miracles.” While I don’t normally review books written for the adult market, “The Age of Miracles” should appeal to teens, as it is essentially a coming of age tale set against a dystopian backdrop. 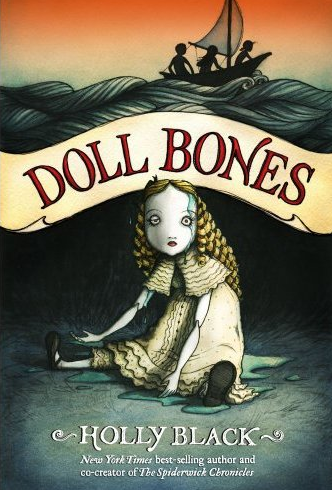 Although more subtle and literary than novels geared directly toward teens, its subject matter and almost cringe-worthy realism should win over many younger fans. We meet Julia and her family on an ordinary sunny Saturday morning in California. Except, this particular morning isn’t so ordinary after all, as Julia soon learns that the Earth’s rotation has slowed overnight. The slowing will continue to increase to a point where sunlight — and darkness — will last for long days on end. As the Earth slows even more, vegetation dies, animal life is depleted, strange weather patterns emerge, sunlight becomes toxic, and people begin to suffer from “gravity sickness.” If all this sounds terribly bleak, quite surprisingly, it’s not. These events are all filtered through Julia’s sensibilities, and she presents much of the horror in a stark, matter-of-fact manner. Julia’s almost detached observations place the slowing in the background as a quiet force that is never sentimental, overpowering, or showy. The real drama, interestingly enough, occurs among the human beings. A conflict erupts between “clock timers” (folks who adhere to the dictates of the clock, regardless of sunlight or darkness) and “real timers” (those people who follow the natural rhythms of sunrise and moonrise, regardless of when they occur). It’s a classic “us against them” struggle, with all the attendant fear outsiders can generate in a trying time. A class schism also erupts, as those with money can afford artificial lawns, personal greenhouses, steel shutters, and sunlight radiation shelters. But none of these are the central source of human tension in “The Age of Miracles.” Instead, it is the family interactions and middle school relationships that form the real heart of this novel. Here’s what I found most amazing about “The Age of Miracles”: middle school kids can be just as horrible, careless, and insensitive as ever, even when life as they know it has been catastrophically altered. Julia is bullied at the bus stop, dropped by her best friend, used by a popular classmate, and excluded from the birthday balloon tradition at school. She pines away for Seth Moreno, the mysterious skater boy who lost his mother to cancer and is alternately warm and indifferent toward Julia. She worries about her unshaved legs and buying her first bra. She tries to mediate the cold hostility between her philandering father and controlling mother, all while seeking her own small piece of independence. Above all, much of “The Age of Miracles” is about one girl’s overwhelming loneliness, which almost trumps the fact that her entire world is, literally, falling apart around her. And you wondered why I called this a “remarkable” novel? Because it is! I’ll give nothing else away, because Julia’s story should be savored by the reader. Walker is a beautiful storyteller who uses spare language and quiet emotion to convey Julia’s fears, pain, and small triumphs. There is not one moment here that is artificially rendered. Everything is conveyed with an almost heartbreaking honesty and stillness. Although written for adults, aside from a bit of language, minor drinking, and the themes involved, older teens should do just fine with this novel. “The Age of Miracles” is a stunning, haunting book about growing up. Please go out and read it now.